Seeking a fast route to stretchable circuits with integrated electronics for on-skin use, a team from Portrugal and the US have developed a technique that avoids clean rooms and photo lithography. Instead, the required conductive pattern is printed onto temporary tattoo paper with an ordinary desktop laser printer. Next, a silver pasted is rubbed onto the print, where it adheres only to the printed toner. On top of the silver paste is rubbed eutectic gallium indium liquid metal alloy (eGaIn) to increase electrical conductivity, and to maintain conductivity during stretching. 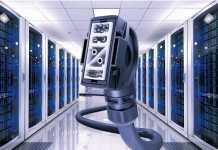 Finally, electronic components are added with a conductive adhesive made from magnetically-aligned eGaIn-coated silver-nickel micro-particles embedded in polyvinyl alcohol (PVA). “This ‘zPVA’ conductive glue allows for robust electrical contacts with microchips that have pins with dimensions as small as 300μm,” according to the the paper ‘Hydroprinted electronics: Ultrathin stretchable Ag–In–Ga e-skin for bioelectronics and human-machine interaction‘, published in Applied Materials & Interfaces. 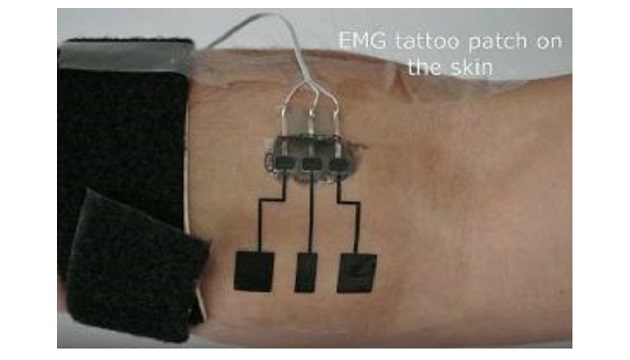 Once the backing paper is soaked off in water, the now free-floating thin-film circuit can be manoeuvred onto the flexible surface such as skin. 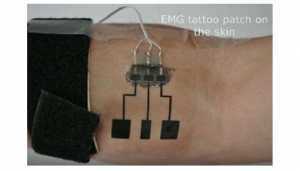 The researchers, from the University of Coimbra and Carnegie Mellon University, transferred the electronic tattoo to various objects and demonstrated versions controlling a robot prosthetic arm, monitoring human muscle activity and adding proximity sensors into a 3d model of a hand.